September 19, 2012 Adri H.
Remember these? 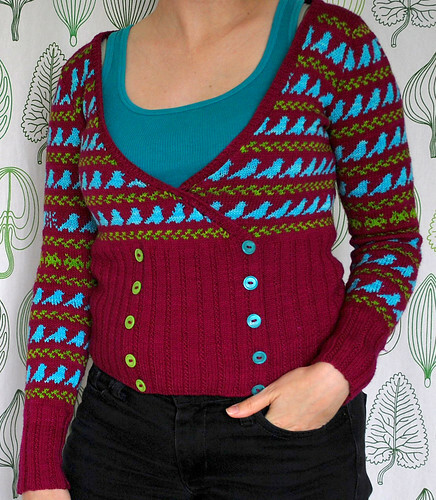 For the Little Birds Cardigan, I pretty much ignored all those suggestions above creating so much more anxiety than need be. Learn from my ridiculousness. a really nice overview of preparing your garment for a steek and cutting. Let's Knit Together walks you through it... she recommends a strong drink beforehand or maybe afterward, I can't remember. Zimmermania walks you through a crocheted steek. This is the one I've done myself in combination with the sewn one from Twist Collective (see below). If you chose to use slick yarns or need sewing reinforcement by hand. It's kind of general info, but helpful. Twist Collective's tutorial on sewn steeking with a sewing machine. And there you go! I hope these help make your steeking experience that much less painful.